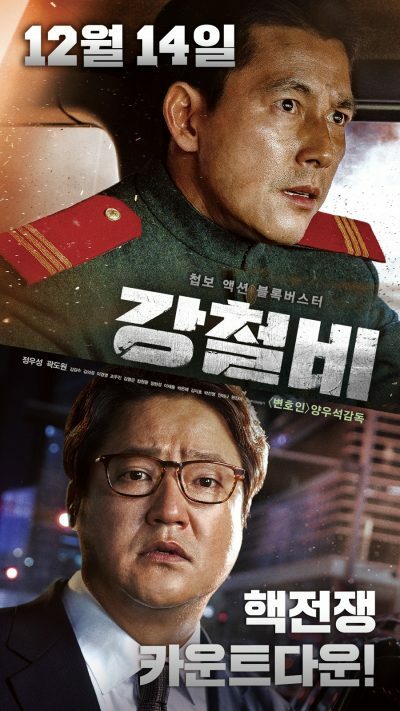 Steel Rain is a Korean thriller movie, written and directed by Yang Woo-suk. It is based on the webcomic of the same name. Retired North Korean agent Cheol-woo Eom is covertly contacted by his former boss, Chief Ri. Ri informs Eom that two senior functionaries (Park and Kim) are plotting a coup. Since the two men are highly placed and can keep Ri from alerting the Great Leader to the plot, Ri has no choice but to have both men killed. Ri cannot use one of his subordinates for the job because if the operative fails, the assassination attempt could touch off an inter-service civil war. If Eom is caught, he can be thrown under the bus. Eom agrees to work for Ri one last time. On a certain fateful day, Eom is in position, ready to kill Park and Kim. There are two problems. The first is that Park is not at the rally where Eom is waiting hidden with his rifle. The second is that agents unknown detonate several hijacked cluster bombs, bombs that kill most of the people attending and leave the Great Leader badly injured, perhaps dying. Luck and skill get Eom through the attack unscathed, as well as the massacre of the few survivors that follows. Realizing a coup is underway, Eom and helpful cheerleaders Kwon and Song flee with the Great Leader into South Korea. Behind them, North Korea descends into chaos. Plump nerd Cheol-wu Kwak has little in common with Eom aside from their shared given name (Cheol-Wu). A senior presidential secretary for foreign affairs and national security in South Korea’s Blue House, Kwak is busy with the transition between the incumbent President Lee and newly elected Kim when word comes of the massacre. Lee is a hawk, while Kim is a dove. Kwak’s role has just become very complicated. Who is responsible for the massacre is unclear to the South Korean government. Also unclear: who controls North Korea’s nuclear missiles. What is clear is that the North blames the South for the massacre. North Korea declares an end to the armistice. Concerned for the trillions of dollars a general Korean war could cost the world economy, America proposes a swift, humane solution to the crisis: four nuclear strikes in North Korea, which would decapitate the North Korean nuclear forces. While there would no doubt be casualties, not to mention armies of refugees fleeing into the neighbouring nations, this is a small price to pay for American and Japanese security. Even as the two Korean Presidents argue whether or not to give in to the American proposal, fate deals Kwak a curious hand. Desperate to save the Great Leader, Eom commandeers the very South Korean clinic where Kwak’s estranged ex-wife works. On the basis of very little information, Kwak works out what is going on. In short order, Eom is captured and the Great Leader is in South Korean hands. Control of the Korean nuclear weapons is key to the coup leader’s plans. He has made one small miscalculation. He requires two devices to unlock and use the North Korean nuclear missile forces. He has one. The other is disguised as the watch the Great Leader wears at all times. Amiable Kwak doesn’t see Eom as the Enemy. He sees the North Korean as someone who, if only Kwak can somehow find common ground, could help resolve the current crisis before it spirals into all-out nuclear war. Those behind the coup in North Korea agree, which is why a veritable army of North Korean special forces are infiltrating South Korea with orders to eliminate Eom and the Great Leader and retrieve the missile codes. Warning: being a lovable, naive cheerleader does not confer any degree of plot armour. In general, the Korean films I have seen have not hesitated to knock off sympathetic characters if the plot demanded it. Steel Rain takes an unsympathetic view of its allies and neighbours. America, Japan, and China are focused on their own well being and on struggles for great power status. All of them would cheerfully throw both Koreas under the bus for their own well being. Sure let’s nuke North Korea, say the Americans … until North Korea demonstrates that it can launch at least one of its nukes, at which point the Americans backtrack. The North Koreans come off as an odd combination of naivety, fanaticism, determination, and professionalism. The coup leaders are motivated by frustration with the Great Leader’s refusal to attack the South with nuclear weapons. They’re also worried by the Great Leader’s tendency to execute his generals. The foot-soldiers in the coup seem to be completely uninhibited by doubt or desire for self-preservation. Clashes between factions therefore entail tremendous body counts on both sides. What raises this above a very slick techno-thriller with impressive special effects is the relationship between amiable Kwak and driven, humourless Eom. Nobody seems to respect the smiling undersecretary, while poor Eom is valuable to his bosses mainly for his expendability. Kwak tries hard to convince Eom to trust him, not because Eom would be a useful tool, but because Kwak likes him . Somehow, whether it’s by offering Eom junk food , by bonding over their daughters’ terrible taste in pop music, or by a shared desire to see Korea avoid nuclear conflagration, Kwak is determined to gain that trust and save Korea. Steel Rain is available on Netflix. 1: Kwak seems to like pretty much everyone. 2: Junk food which a peckish Kwak then eats.